to the country’s justice system, which are seen as increasing political control over the judiciary. Smaller rallies were organised in other cities too. 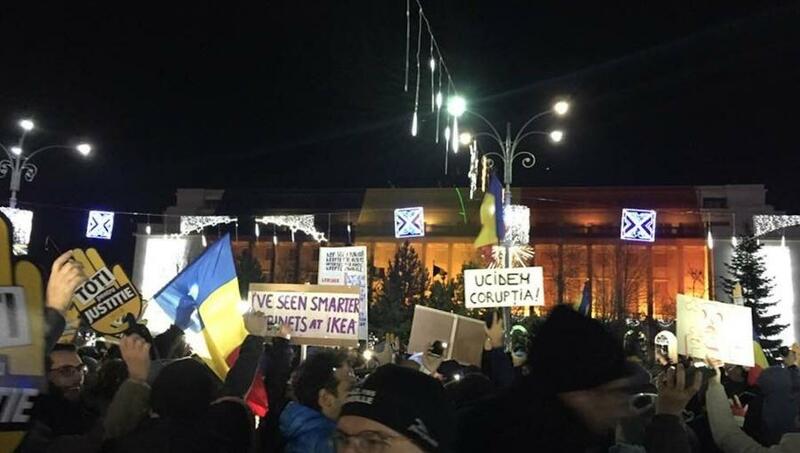 Anti-government protests have been organised regularly in Romania since the end of January. The latest protest will put even more pressure on the government, which has already been widely criticised by opposition and business leaders for its planned measures in both the judiciary and fiscal spheres. This time, the protesters were joined by representatives of the opposition National Liberal Party (PNL), Save Romania Union (USR) and Romania 100 Platform founded by former prime minister Dacian Ciolos, who has announced his intention to found a new party. This move might signal the Romanian opposition could become more active and take more action against the ruling coalition’s moves to change judicial and fiscal legislation. So far, it has often been said that the protesters are the real opposition to the ruling Social Democratic Party (PSD) in Romania. Last week, the Chamber of Deputies voted on a number of amendments to a bill regulating the status of magistrates. According to one of the amendments, the state is required to take action against magistrates who created damages by their actions taken in bad faith. Under current regulations, the state has the option to take action against magistrates. A final vote has not been taken yet. The passed amendments also state that prosecutors are forbidden to make critical remarks about other state authorities (like the legislative or executive). The president will lose the right to return the nomination of top magistrates under the revised regulations. “If the draft bill regarding the magistrates’ status becomes law, the prosecutors’ independence will be eliminated, the judges and the prosecutors will be restricted the right to criticise and express freely, the magistrates may be investigated by parliamentary commissions and the magistrates who have been sent to court will be able to judge and 'to make justice',” the Facebook protest event said. “At the same time, if the draft amendment to the bill on National Agency of Integrity (ANI) passes, the tens of MPs who have used public money to illegally pay relatives will see the band imposed by ANI and confirmed by courts cancelled […] Every day we keep silent and close our eyes to the restraints of our rights, individual freedom, democracy, independence of justice and rule of law moves us away from the democratic world we have entered with so many sacrifices,” the protest organisers said. Mounted police were present at the event, but kept their distance from the protesters. Aside from the street protests in Romania, at the end of November the US State Department expressed its concern that the Romanian parliament is considering legislation that could undermine the fight against corruption and weaken judicial independence in Romania, “We urge the parliament of Romania to reject proposals that weaken the rule of law and endanger the fight against corruption,” the US State Department said in a statement. The Judges Forum and the Prosecutors Association have also asked the parliament to reject the amendments to the judicial legislation, claiming that they should be adopted only following impact studies and consultations, News.ro reported on December 8. The magistrates noted there is “an unjustified and unprocedural hurry” to promote these bills though a “parliamentary pseudo-debate" in which there are no arguments presented.